The Australian and Hulkenberg must bring the team closer to the podiums. The new car was presented on Tuesday and retains 'Mapfre'. 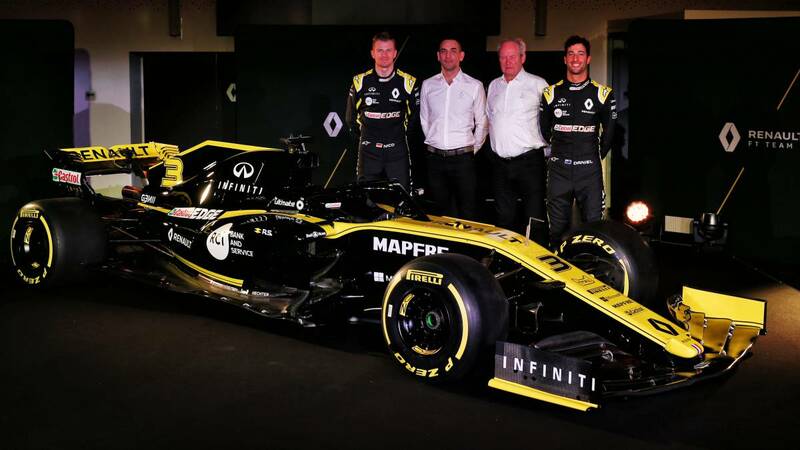 Only Renault can alter the order established in Formula 1 in the short term. The investment of the French group in its sports project is huge and has been done without haste, during the last five years, so that from this season and, above all , in 2020 and 2021, his car is fighting with the leading teams. In this context comes the RS19 presented this Tuesday in Enstone, preserving the colors of the past year but simplifying its shapes in line with the aerodynamic rules of 2019, which will facilitate the rides and help overtaking. As for the advertising presence, is the Spanish insurer 'Mapfre' with an important space, the largest behind the brands associated with Renault. The great winter reinforcement of Renault is Daniel Ricciardo, a pilot who has won seven racing in F1 and that with 29 years, after restraining himself in Red Bull, he wants to get on a car that can make him world champion. His signing was the big surprise of the market and the energy team was informed at the last minute of the non-renewal of the Australian. So Ricciardo removes the burden of measuring himself, day by day, with Verstappen. "Renault has a huge history in the competition, being part of their next step in F1 is exciting, I'm here to do a job on the track and drive as fast as possible, but I also want to bring good energy because it's part of my character "says Daniel. Although it will also be a relief for Renault not having to supply engines to the Austrians after years of misunderstandings and cross-accusations that always had with the twisted gesture to Cyril Abiteboul, responsible for the project. They will be able to focus their efforts on developing a reliable and fast power unit without demanding triumphs since the first grand prize. "An excellent engine is the priority in Viry, and in Enstone we will improve the competitiveness of the chassis", says Abiteboul. Along Ricciardo will be Nico Hulkenberg, whom almost the entire paddock considers the second ideal driver of the Formula 1.The German, of 31 years old, he goes for his tenth season in the big circus and heads one of those classifications that nobody wants to be a part of: he is the driver with the most big prizes ever disputed who has never reached the podium. There are 156 appearances without champagne, although Renault is determined to change that detail. "I think we have one of the strongest pairs of drivers, if not the strongest, Daniel brings experience of proven victories and Nico is hungry, he is undervalued," says the head of Renault Sport. Before showing the forms of the RS19, It projected a video in which all the pilots who have been part of the team appeared in this last period that began with the acquisition of Lotus. A recognition for Jolyon Palmer, Kevin Magnussen and especially Carlos Sainz for the great effort to bring the team to the leading cars. Ricciardo and Hulkenberg have to give the last step.